In this chapter , we study the robust optimal control of nonlinear systems with matched uncertainties. In the first part, the infinite-horizon robust optimal control problem for a class of continuous-time uncertain nonlinear systems is investigated by using data-based adaptive critic designs. The neural network identification scheme is combined with the traditional adaptive critic technique, in order to design the nonlinear robust optimal control under uncertain environment. The robust optimal controller of the original uncertain system with a specified cost function is established by adding a feedback gain to the optimal controller of the nominal system. Then, a neural network identifier is employed to reconstruct the unknown dynamics of the nominal system with stability analysis. Hence, the data-based adaptive critic designs can be developed to solve the HJB equation corresponding to the transformed optimal control problem. The uniform ultimate boundedness of the closed-loop system is also proved by using the Lyapunov approach. In the second part, the robust optimal control design is revisited by using a data-based integral policy iteration approach. Here, the actor-critic technique based on neural networks and least squares implementation method are employed to facilitate deriving the optimal control law iteratively, so that the closed-form expression of the robust optimal controller is available. Four simulation examples with application backgrounds are also presented to illustrate the effectiveness of the established robust optimal control scheme. 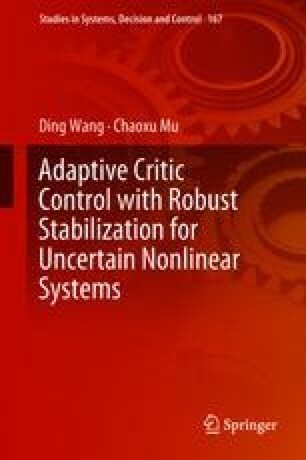 In summary, it is important to note that the results developed in this chapter broaden the application scope of ADP-based optimal control approach to more general nonlinear systems possessing dynamical uncertainties.